Those unfamiliar with Attersee’s work are in for a surprise: the word eclectic was invented to describe his artistic output. Belvedere 21’s excellent Attersee exhibition invites you to explore this Austrian artist’s astonishing creativity. Ah, not an easy question to answer. The best I can come up with is an explosion of colour and creativity that covers everything from sausage packaging to songwriting. Christian Ludwig Attersee is a contemporary artist whose name has spread well beyond the borders of Austria. But the term “artist” seems too small. You might rather call Attersee a renaissance man, having achieved success in a variety of fields. A national sailing champion, his artistic endeavours straddle various genres, including pop art, advertising, music, writing, photography, drawing, painting, and set design. Much like Koloman Moser and others of the earlier Viennese modernist movement, Attersee’s designs and art manifests in various media and forms beyond simple paper and canvas; on wine labels, as glass mosaics in front of department stores, on tapestries…the list is long. The exhibition at Belvedere 21 focuses on Attersee’s early works and his evolution beyond simple pop art. The range of exhibits reflects the diversity of his creations, but also highlights the continuity within this diversity, particularly as regards such themes as eroticism, food, or animals. It’s like a giant artistic pic’n’mix that seems to dance gloriously along the edges and interfaces that defy characterisation. By which I mean Attersee seems to enjoy challenging preconceptions of such banal subjects as food. He seems to revel in combining and integrating topics and motifs that would normally have nothing to do with each other. And everywhere there is colour, creativity and self-confidence. Attersee as a brand, as a philosophy. The result is the weird and wonderful, the product of a prodigious imagination armed with little more than a brush and acrylic paints. The exhibition runs from Friday, February 1, 2019 to Sunday, August 18, 2019. 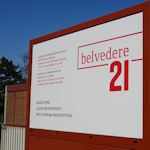 Just get a normal entrance ticket for the Belvedere 21 museum or use a Vienna Pass. For travel tips, see the suggestions for the Belvedere 21 article.